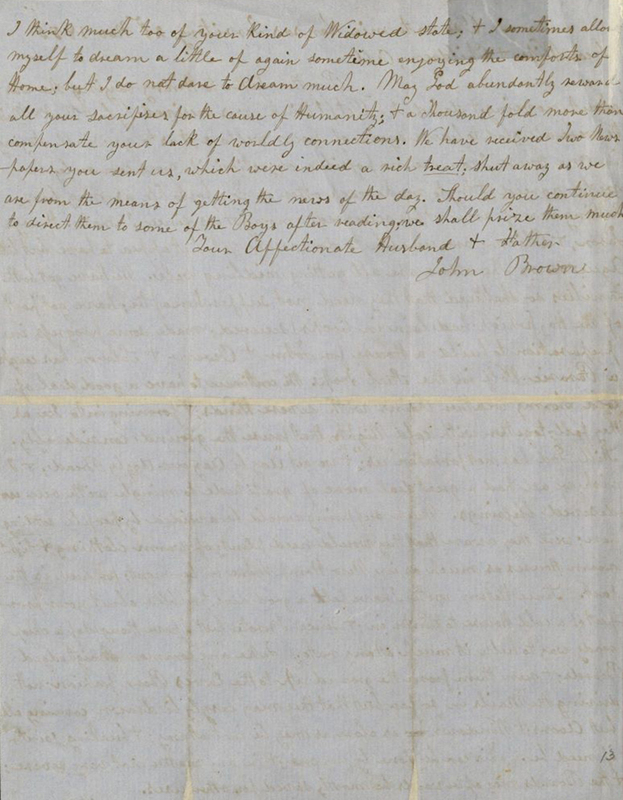 Special Collections and Archives holds a letter from abolitionist John Brown to his wife and children dated November 23, 1855. Brown is best known for attempting to to start a liberation movement among enslaved African Americans, and for his unsuccessful seizure of the United States Armory located in Harpers Ferry, Virginia in 1859, an act often considered a precursor to the American Civil War. John Brown was born in Connecticut to Owen and Ruth Mills Brown on May 9, 1800. Soon after his birth, the family moved to Hudson, Ohio where Owen Brown opened a leather tannery. 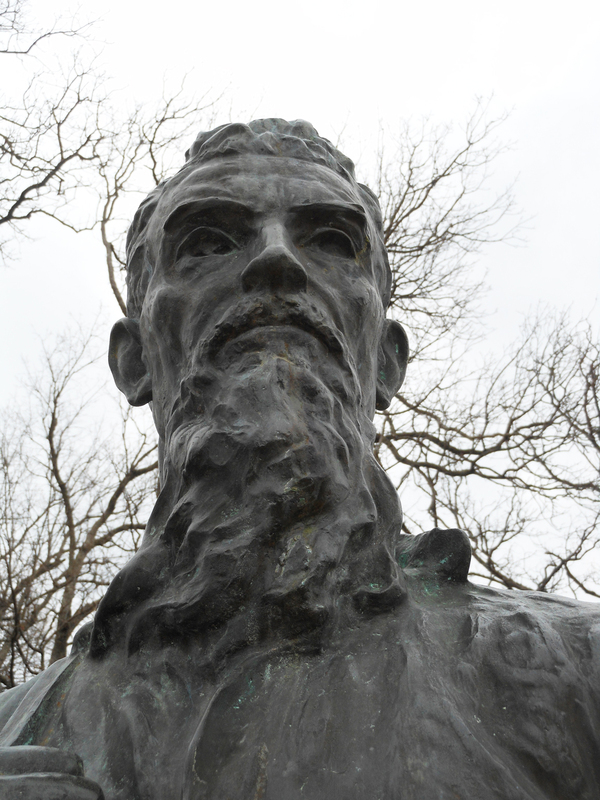 As a teenager, John Brown attended preparatory school in Massachusetts and Connecticut, and as a young man had hopes of becoming a minister, though he did not complete his schooling. After returning to the family home in Ohio, he learned his father’s trade and opened a tannery of his own. Dianthe Lusk and John Brown were married in 1820, and had seven children. In 1825, the young family moved to New Richmond, Pennsylvania where Brown built a second leather tannery that employed over a dozen men. Dianathe Brown passed away in 1832 due to complications during childbirth, and the following year John married Mary Ann Day. The union of John and Mary Ann would eventually produce thirteen children. In 1836, the family moved to Kent (formerly Franklin Mills), Ohio where Brown built another leather tannery. The unstable economy of the late 1830s and unwise business decisions left Brown penniless by the early 1840s. 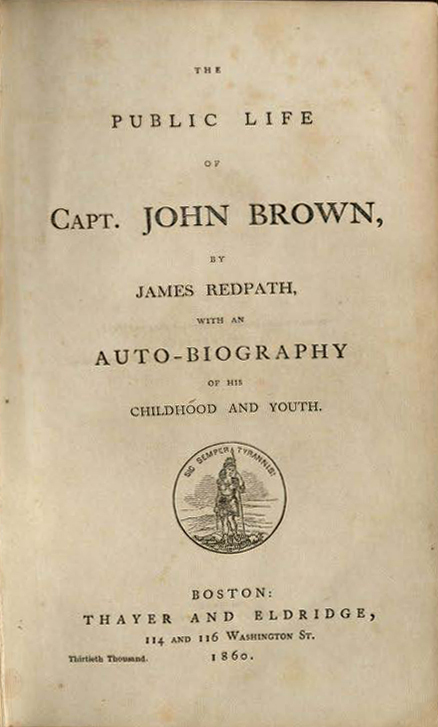 Throughout the 1830s and 1840s, Brown became increasingly concerned with the African-American slave trade, and as he traveled, he met and talked with many like-minded abolitionists. In 1846, Brown and his family moved to Springfield, Massachusetts, a New England community that attracted speakers such as Fredrick Douglas and Sojourner Truth. On September 18, 1850, the United States Congress passed the Fugitive Slave Act. This new federal law ordered the return of escaped slaves in free states and imposed penalties on those who did not comply. In response, John Brown formed the League of Gileadites, whose mission was to lead slaves to freedom. In 1848, the Brown family pulled up stakes once again, moving to New York. The Browns lived in two different homes in what is now the Lake Placid area of New York. Planning to homestead and help turn the west from slavery, the older Brown sons left for the Kansas Territory. 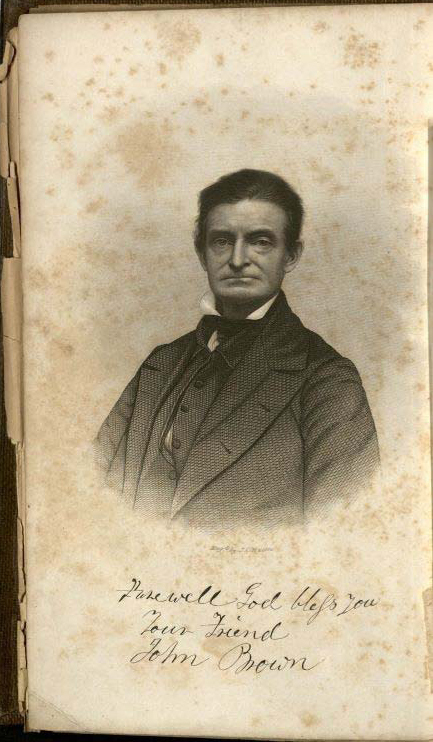 With his wife and young children still in New York, John Brown left for Kansas in early summer 1855. 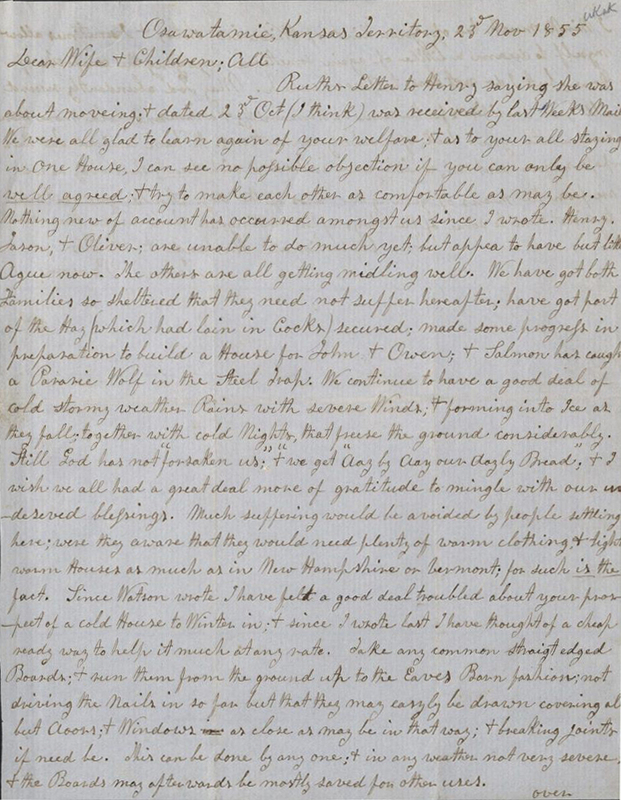 He sent the letter held in Special Collections and Archives to his wife Mary Anne, reflecting on his daily life in Kansas. 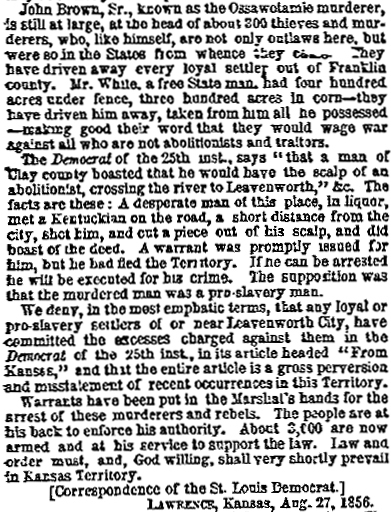 Violent confrontations broke out between anti-slavery and pro-slavery groups during this period, which is often referred to as Bleeding Kansas, Bloody Kansas or the Border War. Brown was suspected of being involved in the May 1856 Pottawatomie Massacre in which five pro-slavery settlers were bludgeoned to death, and was eventually hanged for treason, conspiracy, and murder on December 2, 1859.